Bob White has been active as a dramaturg and director in the Canadian theatre for almost forty years. Based in Calgary, he curated the Enbridge playRites Festival at Alberta Theatre Projects for 22 years. Previously, he was artistic director at Factory Theatre in Toronto and Playwrights Workshop Montreal. 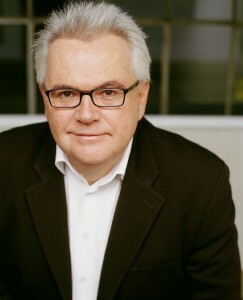 He is currently Consulting Director, New Plays at the Stratford Shakespeare Festival. Awards include an Honorary Doctorate (LLD) from the University of Calgary and membership in the Order of Canada. First, a sense that the writer is writing for the stage and not another medium. Secondly, a strong point of view that is reflected in the actual content of the work and the style of the piece. What I would call a distinctive voice. How important is the workshop process in developing a new script? And how many is too many? I don’t think there is a formula here that one can apply across the board. Theatre is a collaborative art form, and the sooner a writer realizes that directors/actors/designers and yes, audiences, are going to shape the play, the happier and more productive a writer they are going to be. If nothing else, workshops help writers hear the play, and if they’re smart, they’ll listen to how their dialogue translates into actual speech. I think it’s vital that all involved in a workshop realize that the job isn’t to “fix” the play. It’s an exploration where we all embark on a journey to simply explore the work. At the end of the journey, it’s up to the playwright to decide if they want to make changes. It doesn’t really matter, but I prefer standard formats—and 12pt fonts. And most importantly, formats that are Kindle-friendly. Stage directions that try to dictate emotional terrain are not helpful: surely the actual text is going to relay all that information. I personally don’t need much information, but I can see where they are sometimes helpful. If they approach the length of Shaw’s—you’ve gone too far. Well, I’ve read a lot of plays over the past forty years, so I can get bored pretty quickly. And that happens when the material is overly familiar or is exploring emotional terrain that we’ve visited an awful lot. For example, if you are writing a play about child abuse, it has to be pretty amazing stylistically for me to be engaged. Personally, I’m more of an aesthete than a moralist. You might want to argue, for example, that your play about climate change must be seen by everyone because it will help save the planet. I don’t care unless it is a beautiful, engaging, emotionally grounded artistic experience. I don’t go the theatre for ideas; I go to experience a heightened sense of life in all its dimensions. Well, the obvious one is scene length. There are many great plays that are written with an episodic structure: Shakespeare being the prime example. And I’m not going to hold up Aristotle as a model to all. But, I have to admit my heart sinks a bit when I start reading a play and I realize that we’re going to many, many locations and we have scenes composed of ten lines each. This is not radical, avant garde writing, folks. Embrace the notion of a scene with a dramatic action at its core: a character wants something and we watch them achieve that goal or they’re prevented from getting it. We’re creating drama, not performance art. Well, hopefully the one that somebody just finished yesterday. Plays exist in time and their “importance” has to do with how they resonate with the zeitgeist at the moment of their creation. So, there are dozens and dozens of “important” plays for many different reasons. A totally personal choice, and probably because I had the opportunity to direct it, is Tony Kushner’s Angels in America. So big, so imaginative, so funny, so beautiful. The full meal deal. Write what they know about. We need to explore the limits of our imaginations and push the boundaries of what we think theatre is and can be. What do you think about the state of new plays in Canada at the moment? Are you excited by it? I am an eternal optimist. I don’t think I could have hung in for the past 40 years if I didn’t feel that the new play scene was constantly growing and maturing. For some reason, it seems that people will always want to write for the live experience, despite the appeal of other media. The kind of plays we see will change as the audience changes. I look forward to those experiences. See and read as many plays as you can. It doesn’t matter where they live on the theatrical food chain. Look for the heart of the work—what aspect of the human experience is the writer trying to explore? What does it mean for you? Are you bored? Why? Get over yourself. An arrogant ego is essential to survive in the business we call show, but learn to be a real team player.